Canadian Pacific Railway was founded in 1881 to link Canada's populated Eastern centres with the vast potential of its relatively unpopulated West. On Nov. 7, 1885, the Eastern and Western portions of the Canadian Pacific Railway met at Craigellachie, B.C., where Donald A. Smith drove the last spike. The cost of construction almost broke the Canadian Pacific Railway Company, but within three years of the first transcontinental train leaving Montreal and Toronto for Port Moody on June 28, 1886, the railway's financial house was once again in order and CPR began paying dividends again. By 1889, the railway extended from coast to coast and the enterprise had expanded to include a wide range of related and unrelated businesses. CPR had been involved in land settlement and land sales as early as September 1881. The company also erected telegraph lines right alongside the main transcontinental line, transmitting its first commercial telegram in 1882. The same year also marked CPR's entry into the express shipment business, with the acquisition of the Dominion Express Company. CPR started building some of its own steam locomotives as early as 1883 and would later build its own passenger cars, making it second only on the continent to the Pullman Company of Chicago, Illinois. With the outbreak of World War II, the entire Canadian Pacific network was put at the disposal of the war effort. On land, CPR moved 307 million tons of freight and 86 million passengers, including 280,000 military personnel. At sea 22 CPR ships went to war where 12 of them were sunk. In the air, CPR pioneered the "Atlantic Bridge" – a massive undertaking that saw the transatlantic ferrying of bombers from Canada to Britain. In the 1950s, CPR chief Norris R. Crump repatriated the company, putting a majority of shares back in the hands of Canadian stockholders. He also presided over complete dieselization of the company's fleet of locomotives and managed a huge expansion into non-transportation sectors, setting up Canadian Pacific Investments in 1962. Today, CPR's 14,000-mile network extends from the Port of Vancouver in the Canada's West to The Port of Montreal in Canada's East, and to the U.S. industrial centers of Chicago, Newark, Philadelphia, Washington, New York City and Buffalo. 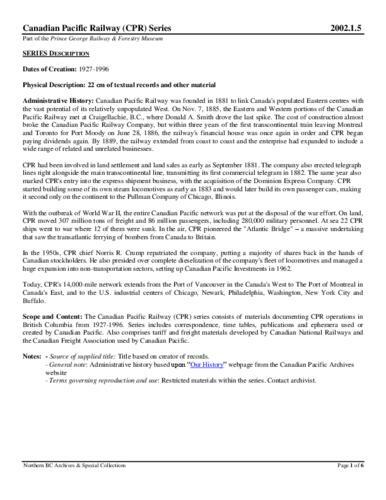 The Canadian Pacific Railway (CPR) series consists of materials documenting CPR operations in British Columbia from 1927-1996. Series includes correspondence, time tables, publications and ephemera used or created by Canadian Pacific. Also comprises tariff and freight materials developed by Canadian National Railways and the Canadian Freight Association used by Canadian Pacific.